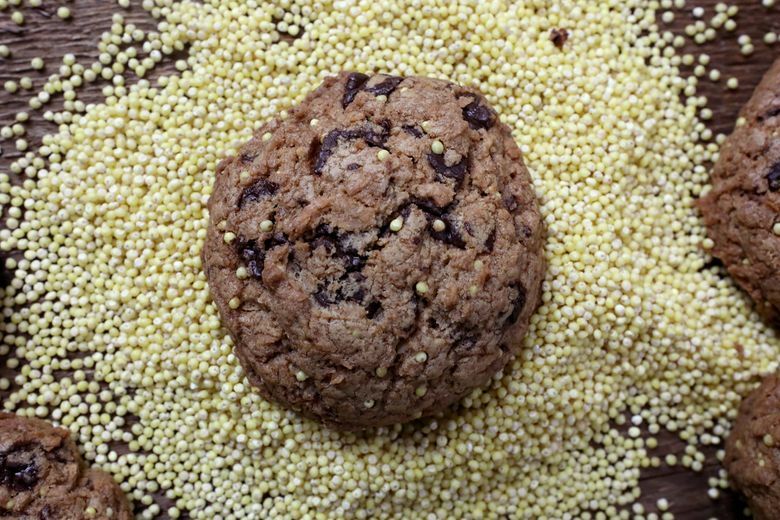 TO UNDERSTAND THE millet problem, consider Jess Thomson’s excellent Cinnamon-Coconut Chocolate Chunk Cookies. “Birdseed?” my husband asked when I told him the key to their crunch. Yes — and a lot more. For various reasons — some good, some intimidating — we’re all soon likely to become more familiar with the tiny seed. Millet is nutritious. It can be productive even under harsh growing conditions and on marginal land, as Washington State University researchers wrote in one paper on the variety known as proso millet. It’s got a short growing season, and it’s heat-tolerant and drought-resistant. In a future of unknown climate changes and alarming weather patterns, it’s finally getting more serious attention. 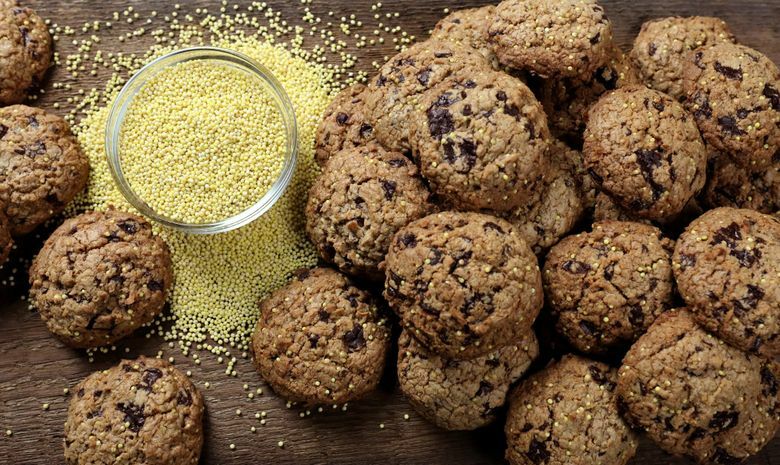 From a global perspective, it’s a little odd that American customers aren’t already more familiar with millet, says Jeremy Bunch, research director for Northwest-based Shepherd’s Grain, the farmer-owned flour company. In other parts of the world, including Asia, Africa and India, it’s a staple grain. Shepherd’s Grain doesn’t use millet in its flours. But the company is committed to no-till farming, which relies on crop rotation. The current challenge for farmers, Bunch says, would be, “ ‘Millet might be a great rotation crop, but where am I going to sell it?’ They can’t just take it to the local grain elevator.” Part of his work is helping find other options. In the United States, most of the millet crop is used for — yes — birdseed, as well as “cattle-fattening rations,” according to the WSU researchers. But its capacity is a lot broader, as Ghostfish Brewery Company co-owner Brian Thiel found when testing millet in beer. His wife hadn’t found a good beer she could drink since her diagnosis of celiac disease, he says. The early days of gluten-free beers were about as pleasing as early gluten-free breads. To his palate, it has a great flavor for brewing, with notes of biscuits and bread. (For millet flours, King Arthur Flour describes the flavor as corn-like.) It’s been used in brewing for eons, predating barley, Thiel says. More fundamentally, millet doesn’t have the advantage that other grains have of decades of scientific research and focus on breeding the best versions possible for brewing. 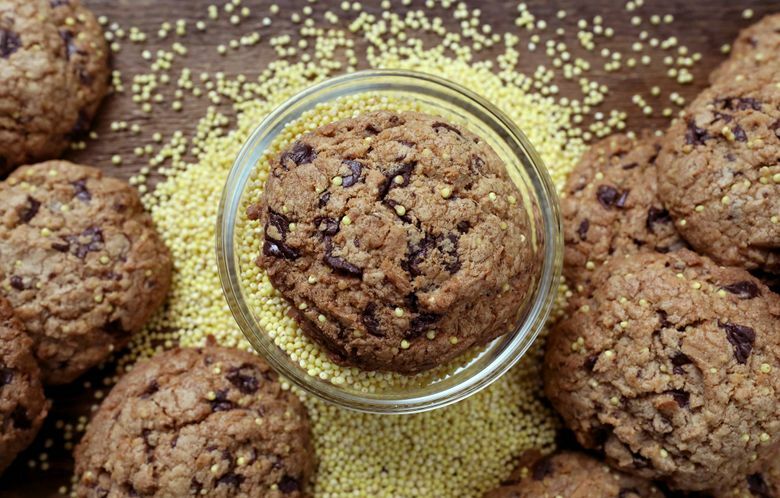 Millet’s getting at least some of that attention now, with progress in genetic mapping and with interest in developing varieties that can adapt to different growing conditions and needs — and, perhaps, our recipes. Kevin Murphy, who leads the specialty crop breeding and agronomy program at WSU, says his research group has been testing millets in the United States as well as Rwanda for the past six years or so. 1. Preheat the oven to 350 degrees. Line two heavy baking sheets with parchment paper, and set aside. 2. In the bowl of a stand mixer fitted with a paddle attachment (or using a handheld electric mixer), cream the butter and both sugars on medium-high speed until light and fluffy, about 3 minutes. Add the eggs one at a time on low speed, beating well after each addition. Beat in the vanilla extract, and mix again. 3. Meanwhile, whisk together both flours, baking soda, salt, cinnamon, coconut and millet in a medium bowl. Add the dry ingredients to the wet mixture about a third at a time, mixing on low speed until just combined between additions, and scraping the bottom of the bowl clean when necessary. Fold in the chocolate chunks. 4. Drop the dough by heaping spoonfuls (a 1½-inch ice cream scoop works perfectly) about 2 inches apart on the baking sheets. Bake 12 to 15 minutes for cookies the size of a walnut, 14 to 17 minutes for cookies the size of a golf ball, or until the edges are lightly browned and just beginning to crack. (The cookies will not spread much, so roundish dough portions work better than lumpy ones.) Cool the cookies on sheets for 5 minutes, and transfer to wire racks to cool completely. Recipe courtesy of Jess Thomson, jessthomson.wordpress.com. Greg Gilbert is a Seattle Times staff photographer.